I have no real fancy name for this Quiche. The best I could come up with was “Quiche Aux Choux” – but I am not French and although Google Translate so confidently translated “Quiche with Brassica” for me, when I tried it in reverse it merely came up with “Quiche Cabbage”. Although that is not too far off from what it is supposed to be (if the words were flipped), I have stuck with Brassica Quiche – to save myself any embarrassment. So, why Brassica? Well, for those of you that don’t know, Brassica is the blanket name for all plants in the mustard family. This includes cauliflower, broccoli & cabbage – to name a few. This quiche, in my opinion, can be made with any of these vegetables. The beauty about using vegetables from genus Brassica is that they are readily available to us in supermarkets. Brassicas vary so much in flavour and texture. This means you can create many different versions of the same dish – each unique in it’s own way. If you use the basic “Anchor” ingredient recipe below – you can be free to experiment with any “Variable” ingredients you like – try mushrooms instead of Brassicas, or try it with 300 grams of different cheeses. Whatever you do, it will be good. 300 grams of grated cheese (any that you prefer). 250 grams of diced bacon – tossed in a hot pan until it is coloured – but not dry. 200 grams of any Brassica vegetable you can get your hands on. Herbs – in most cases I use fresh Thyme. Use as much or as little as you like and remember to leave a bit for garnishing – simply place it on top of your quiche before baking. As it dries in the hot oven, it also soaks up the oils from the cheese and becomes slightly glossy – looks amazing. Shortcrust Pastry (If you use my recipe it is more than enough). I put shortcrust pastry under “Variable” ingredients because you don’t necessarily need pastry – you can bake it in a baking dish for a healthier option. 1. Blind bake your pastry in a fluted quiche tin until it starts to brown slightly – don’t overdo it as it will brown a lot more when you cook it again with the rest of the ingredients. It should take about 40 minutes. When it is done, set aside in the tin to cool slightly. 2. Mix all the “anchor ingredients” together along with the herbs. Taste it (if you aren’t squeamish about trying raw egg) to see if it is salty enough. Remember though that when it is all cooked, the bacon and cheese do impart their saltiness throughout the mixture so be careful how much you put. In fact, it should taste slightly under salted. 3. Prepare your Brassica. If using chunky ones like Cauliflower & Broccoli, simply cut them into bite size, chunky pieces. 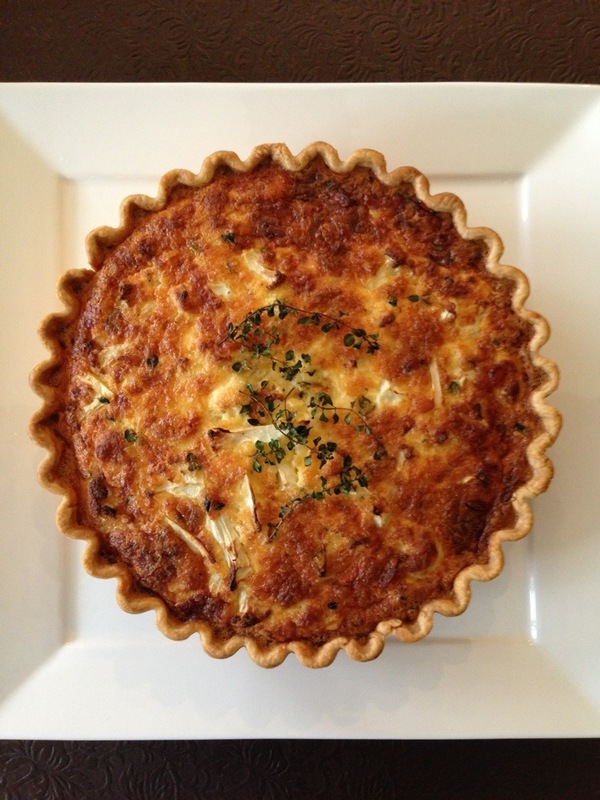 Remember that you are probably going to fork the Quiche when you eat it – so cut them just big enough to fit in one mouthful, along with the other components like the egg mix, bacon and pastry. You want everything in your mouth at once. 4. Give the egg mixture a good stir and pour a little into the empty, baked pastry casing. Make sure you pour in some of the good stuff too. By that I mean the cheese & bacon. 5. Tumble in all of the Brassica, making sure that you get a good variation of stems & florets (if using Broccoli & Cauliflower) radially throughout the casing in such a way that each slice of Quiche will get a good, variable amount. 6. Pour in the rest of the egg mixture evenly over the casing. 7. Use the handle of a fork or spoon to shift around the Brassica and evenly distribute any cheese and bacon that didn’t filter through. This will ensure that the ingredients in the middle layers of Quiche will be mixed well. Remember to leave a generous amount of each ingredient at the very top, un-submerged in the liquid mix so that they become brown and fragrant when baked. 8. Put your garnish on top with the stems on and place the Quiche in the oven. Bake for approximately 1 hour and 15 minutes. Make sure you rotate the Quiche every 15 minutes or so for it to evenly brown all over. After about 45 minutes into cooking, place both hands on either side of the tin (with oven mitts on of course) and give it a jiggle. It is done when the centre does not slosh around freely but shudders with a stiffness – a bit like well set jelly when shaken. If that is how it is, it is done. Remove from the oven and let it cool slightly. Remove it from the fluted tin, cut and serve.